Amal is a Twitter personality and propagandist for ISIS. Her accounts are continually suspended by Twitter, but she is able to resurface after a few hours under another iteration of her “@BintRose” handle. 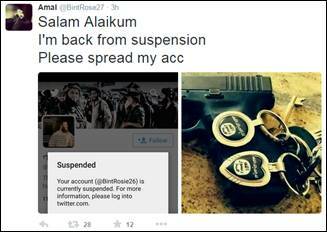 With each new profile’s first tweet, Amal includes a screenshot of her previous suspension notice and a photo of ISIS-logo accessories. 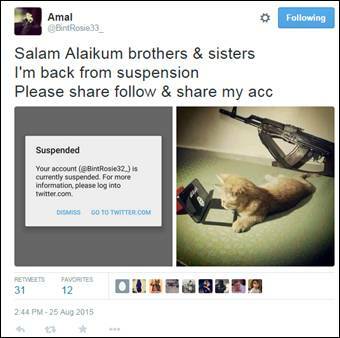 Amal has tweeted complaints about “mass suspensions” of her and her Twitter counterparts,Amal, Twitter, accessed June 23, 2015, https://twitter.com/BintRose10. and has taunted Twitter admins, asking, “when do you finally get that we always come back, no matter how often you suspend our acc? !”Amal, Twitter post, August 31, 2015, 12:51 p.m., https://twitter.com/BintRosie33_/status/638393792538804224. She frequently promotes the accounts of fellow jihadist Twitter propagandists. Most of her tweets avidly support ISIS, often advocating jihad and defending the actions of the terror group. She has claimed that “Allah” is responsible for the terror group’s success.Amal, Twitter, accessed June 23, 2015, https://twitter.com/BintRose10. She has denounced “coconuts,” a derogatory term used by Islamists to describe moderate Muslims. Amal does not disclose her place of residence on her Twitter profile.BintRose10, Twitter, accessed June 23, 2015, https://twitter.com/BintRose10. However, a follower once tweeted to her and implied that she lived in Austria, to which Amal tweeted a response, urging to keep such information private.BintRose10, Twitter, accessed June 23, 2015, https://twitter.com/BintRose10. Her first tweet on @bintrose10 contained a picture of her suspension notice, which was written in German.BintRose10, Twitter, accessed June 23, 2015, https://twitter.com/BintRose10. Nevertheless, the majority of her tweets are written in English.BintRose10, Twitter, accessed June 23, 2015, https://twitter.com/BintRose10. Amal writes poorly of her country, highlighting what she perceives to be its rejection of haqq (“truth” in Arabic). @BintRose10BintRose10, Twitter, accessed June 23, 2015, https://twitter.com/BintRose10. @BintRose23_Amal, Twitter post, July 20, 2015, 11:37 a.m., https://twitter.com/BintRose24/status/623200105844318208. @BintRose24Amal, Twitter post, July 20, 2015, 11:37 a.m., https://twitter.com/BintRose24/status/623200105844318208. @BintRose25_Amal, Twitter, accessed July 22, 2015, https://twitter.com/BintRose25_. @BintRose_25Amal, Twitter, accessed July 23, 2015, https://twitter.com/BintRose_25. @BintRose26Amal, Twitter, accessed July 30, 2015, https://twitter.com/bintrose26. @BintRosie26Amal, Twitter, accessed August 3, 2015, https://twitter.com/BintRosie26. @BintRose27Amal, Twitter, accessed August 6, 2015, https://twitter.com/bintrose27. @BintRose28Amal, Twitter, accessed August 10, 2015, https://twitter.com/bintrose28. @BintRosie28Amal, Twitter, accessed August 10, 2015, "https://twitter.com/bintrosie28. @BintRose29Amal, Twitter, accessed August 11, 2015, https://twitter.com/BintRose29. @BintRosie29Amal, Twitter, accessed August 18, 2015, https://twitter.com/bintrosie29. @BintRosie29_Amal, Twitter, accessed August 20, 2015, https://twitter.com/BintRosie29_. @BintRose31Amal, Twitter, accessed August 22, 2015, https://twitter.com/BintRose31. @BintRosie32_Amal, Twitter, accessed August 24, 2015, https://twitter/com/BintRosie32_. @BintRosie33_Amal, Twitter, accessed August 31, 2015, https://twitter/com/BintRosie33_. 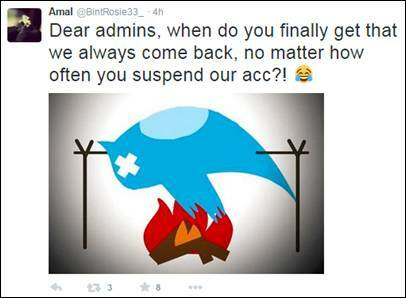 @BintRosie34Amal, Twitter, accessed September 7, 2015, https://twitter.com/BintRosie34. @BintRose35Amal, Twitter, accessed September 8, 2015, https://twitter.com/BintRose35. @BintRosie37Amal, Twitter, accessed September 9, 2015, https://twitter.com/BintRosie37. @BintRose37_Amal, Twitter, accessed September 1, 2015, https://twitter.com/BintRose37_. @BintRose38Amal, Twitter, accessed September 13, 2015, https://twitter.com/BintRose38. @BintRose43Amal, Twitter, accessed September 16, 2015, https://twitter.com/BintRose43. @BintRosie44Amal, Twitter, accessed September 16, 2015, https://twitter.com/BintRosie44. @BintRose44_Amal, Twitter, accessed September 18, 2015, https://twitter.com/BintRose44_. @BintRosie45Amal, Twitter, accessed September 30, 2015, https://twitter.com/BintRosie45. @BintRose47Amal, Twitter, accessed September 29, 2015, https://twitter.com/BintRose47. @BintRosie47Amal, Twitter, accessed September 29, 2015, https://twitter.com/BintRose47. @BintRose50Amal, Twitter, accessed October 2, 2015, https://twitter.com/BintRose50. @BintRose52Amal, Twitter, accessed October 5, 2015, https://twitter.com/BintRose52. @BintRose53Amal, Twitter, accessed October 7, 2015, https://twitter.com/BintRose53. @BintRose55Amal, Twitter, accessed October 10, 2015, https://twitter.com/BintRose55. @BintRose56Amal, Twitter, accessed October 13, 2015, https://twitter.com/BintRose56. @BintRose57Amal, Twitter, accessed October 14, 2015, https://twitter.com/BintRose57. @BintRose58Amal, Twitter, accessed October 15, 2015, https://twitter.com/BintRose58. @BintRose59Amal, Twitter, accessed October 27, 2015, https://twitter.com/BintRose59. @BintRose66Amal, Twitter, accessed November 4, 2015, https://twitter.com/BintRose66. @BintRose67Amal, Twitter, accessed November 4, 2015, https://twitter.com/BintRose67. @BintRose69Amal, Twitter, accessed November 9, 2015, https://twitter.com/BintRose69. @BintRose70Amal, Twitter, accessed November 15, 2015, https://twitter.com/BintRose70. @BintRose71Amal, Twitter, accessed November 15, 2015, https://twitter.com/BintRose71. @BintRose72Amal, Twitter, accessed November 15, 2015, https://twitter.com/BintRose72. @BintRose73Amal, Twitter, accessed November 15, 2015, https://twitter.com/BintRose73. @BintRose74Amal, Twitter, accessed November 15, 2015, https://twitter.com/BintRose74. @BintRose75Amal, Twitter, accessed November 16, 2015, https://twitter.com/BintRose75. @BintRose76Amal, Twitter, accessed November 16, 2015, https://twitter.com/BintRose76. @BintRose77Amal, Twitter, accessed November 16, 2015, https://twitter.com/BintRose77. @BintRose78Amal, Twitter, accessed November 16, 2015, https://twitter.com/BintRose78. @BintRose79Amal, Twitter, accessed November 17, 2015, https://twitter.com/BintRose79. @BintRose80Amal, Twitter, accessed November 17, 2015, https://twitter.com/BintRose80. @BntRose86Amal, Twitter, accessed November 30, 2015, https://twitter.com/BntRose86. @BintRose92Amal, Twitter, accessed December 2, 2015, https://twitter.com/BintRose92. @Bint93RosesAmal, Twitter, accessed December 8, 2015, https://twitter.com/Bint93Roses. Amal is a Twitter personality and propagandist for ISIS. “See how many countries wage a war against the IS. They see the Khilafa as serious threat & try everything to hold on to power but they can’t” (Tweet)Amal, Twitter post, September 8, 2015, 8:07 a.m.
“Those who slander the IS should think of what they’ve done for the Ummah.Most likely nothing!They sit among the kuffar & sugarcoat the Islam.” (Tweet)Amal, Twitter post, August 16, 2015, 9:42 p.m., https://twitter.com/BintRosie29/status/633136714203156480. “It's such a shame that leaders of Islamic countries put their interests at first & leave the path of Allah (SWT). May they all burn in hell” (Tweet)Amal, Twitter post, August 16, 2015, 12:15 p.m., https://twitter.com/BintRosie29/status/632994048274493440. “Is the #IS would be as horrible as medias claim they wouldn’t get this great support by muslims & tribes wouldn’t give pledges. But you can” (Tweet) Amal, Twitter post, August 7, 2015, 6:53 p.m.
“The Shari’ah is Allah’s law!!! NOT the man made law called democracy. So stop saying the #IS doesn’t represent the Islam. 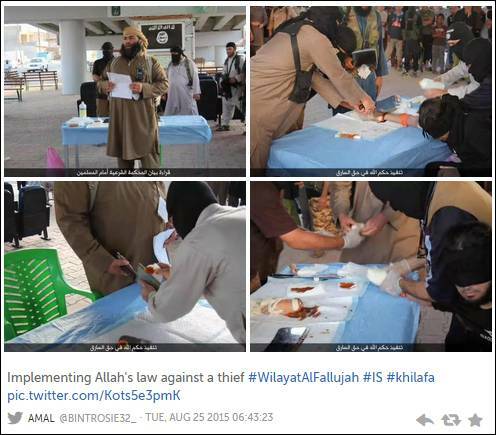 You’re talking…” (Tweet)Amal, Twitter post, July 29, 2015, 8:56 a.m.
“Kuffar wish to see a victory against the IS. They say turkey has waited long enough to attack them. InshaAllah they’ll cry big tears soon” (Tweet)Amal, Twitter post, July 24, 2015, 2:45 a.m.
“current events show again: #IslamicState is on the path of Allah (SWT) They would neither takr Kuffar [nonbelievers] as their allies nor lie to the muslims” (Tweet)Amal, Twitter post, July 3, 2015, 9:38 p.m.
“had a discussion about the Islam with a kafir [nonbeliever] & it ended with ‘The IS destroyed cultural artefacts, that’s not acceptable’.” (Tweet)Amal, Twitter post, May 20, 2015, 10:15 a.m., hhttps://twitter.com/BintRose10/status/601043627146620930. “Freeing the prisoners in every city they liberate is just another example for the good deeds of our Mujahideen.” (Tweet)BintRose10, Twitter post, May 20, 2015, 2:19 p.m., https://twitter.com/BintRose10/status/601104990283931648. and fear the disbelievers” (Tweet)BintRose10, Twitter post, May 18, 2015, 10:57 p.m., https://twitter.com/BintRose10/status/600510683697000448. “It’s depressing that there’s not a single scholar in my country who exhorts the ppl & calls for Jihad.” (Tweet)BintRose10, Twitter post, May 18, 2015, 9:44 a.m., https://twitter.com/BintRose10/status/600311107505549312. 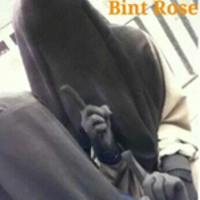 “They spread their nonsense & ppl blindly follow them And those who have spread the haqq were sent to prison...I hate this place” (Tweet)BintRose10, Twitter post, May 18, 2014, 9:50 a.m., https://twitter.com/BintRose10/status/600312526417571840. “How can coconuts complain about the expanding of the IS when it happens with Allah’s permission.” (Tweet)BintRose10, Twitter post, May 18, 2015, 5:03 p.m., https://twitter.com/BintRose10/status/600421492577435648. “The faith of the believers is greater than their fear.” (Tweet)BintRose10, Twitter post, May 18, 2015, 1:30 p.m., https://twitter.com/BintRose10/status/600367845776728064. “A typical thinking of Kuffar [nonbelievers] ‘the more you have the more it wokrs’ [sic]. Our Mujahideen captured cities even if their numbers were small.” (Tweet)BintRose10, Twitter post, May 18, 2015, 5:51 p.m., https://twitter.com/BintRose10/status/600433447262367745.